Good morning, RVA! It's 44 °F now, but later this afternoon get excited for some more temperatures in the mid 70s. I’m loving this spring! I’ve been going on and on about the budget for the past couple months with a focus mostly on the Mayor’s proposed investment in schools, but the potential funding for streets is important, too! We all use our streets—either driving alone in our cars (boooo! ), taking the bus, riding a bike, or just crossing the street on foot. Bike Walk RVA has a good post up linking the Mayor’s financial commitment to streets in his budget to his Vision Zero policy commitment from a couple years back. More Brookland Park Boulevard news! Yesterday, we learned that there’s room for a new brewer on the Boulevard, and, today, Jonathan Spiers at Richmond BizSense says the Brookland Park Threatre building is officially for sale. Richard Hayes at RVAHub has the beer pun I was looking for yesterday. It’s not just Richmond City that’s wrapping up their budget process, Chesterfield County just passed their budget last night, says Sean Gorman at the Richmond Times-Dispatch. Two interesting pieces of information: County schools got shortchanged $1.9 million by the state, and contingency funding was used to fill the gap. County Supervisor Jim Holland said “I’m sure there are other localities that will not be able to fund the gap that was left by the state.” YES, WE KNOW, JIM. Also, I chuckled at this comment from Supervisor Steve Elswick: “Does everyone get everything they want? No, you never will, there’s not enough money in Chesterfield County to pay for all the wants.” Says the guy who reduced the County’s real estate tax by a penny last year. Do you remember that fascinating story a while back about a persistent GPS error that confuses truck drivers looking for “White Oak Creek Drive” and sends them, instead, zooming down the absolutely residential “White Oak Road?” The RTD’s C. Suarez Rojas says Henrico County’s Board of Supervisors hopes to solve the problem by renaming the former to Technology Creek Drive. I just think this is so incredibly interesting/unsettling! Instead of getting the GPS directions fixed with whatever technology companies, it was easier to literally rename the street. A very important announcement: The pizza-as-big-as-your-face spot, Benny Ventano’s is now open! 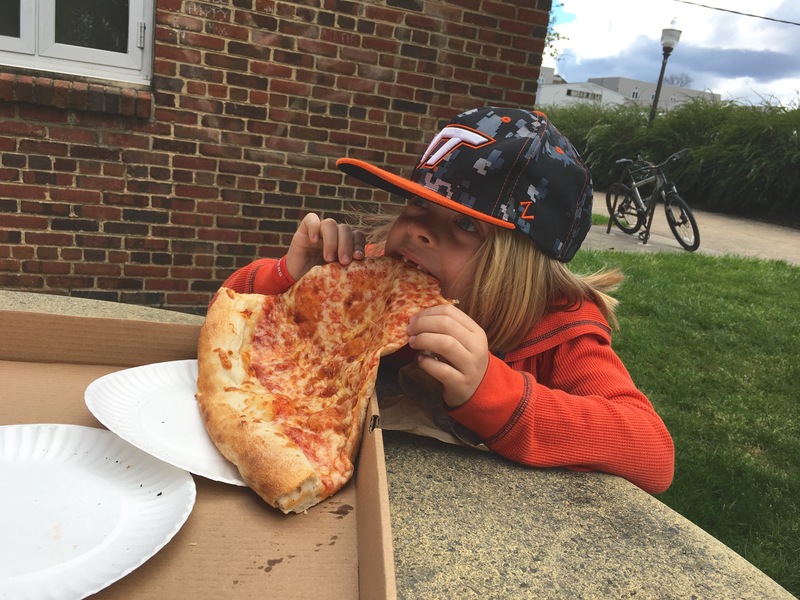 Karri Peifer at the RTD has the details, or you can just look at this circa-2016 picture of my son eating a pizza that’s way bigger than his face at the Blacksburg location. It’s all the details you need. Sometimes the internet is great.